VANCOUVER, July 31, 2017 /CNW/ – NexGen Energy Ltd. (“NexGen” or the “Company“) (TSX:NXE, NYSE: NXE) is pleased to announce the positive results of its independent maiden Preliminary Economic Assessment (“PEA“) of the basement-hosted Arrow Deposit, located on the Company’s 100% owned Rook I project in Saskatchewan’s Athabasca Basin. The maiden PEA was completed by Roscoe Postle Associates Inc. (“RPA“), and is based on the mineral resource estimate announced by the Company in March 2017 (with an effective date of December 20, 2016) that comprised an Indicated Mineral Resource of 179.5 M lb of U3O8 contained in 1.18 M tonnes grading 6.88% U3O8, and an Inferred Mineral Resource of 122.1 M lb of U3O8 contained in 4.25 M tonnes grading 1.30% U3O8. The PEA does not include the results of the Company’s winter or summer 2017 drill programs which will total over 66,000 m of additional drilling. 1. Based on an 8% Discount Rate. 2. Based on a 0.80 USD / 1.00 CAD Exchange Rate. 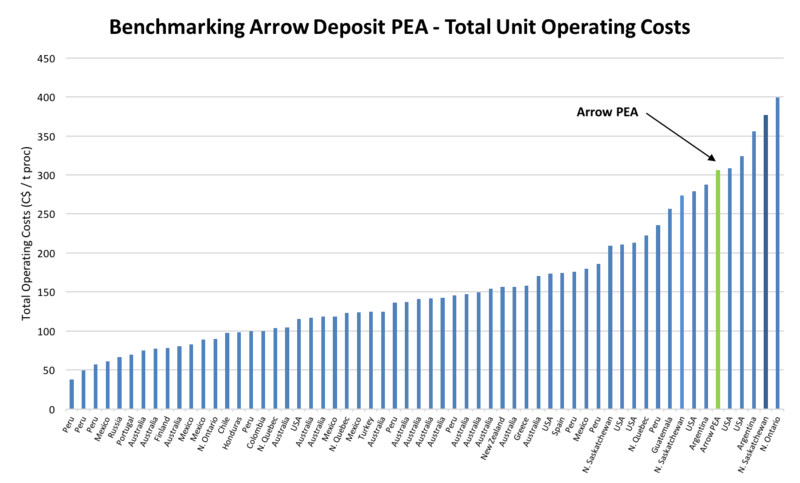 The PEA envisions a production profile supported by conventional long-hole stope mining averaging 1,448 tonnes per day at an average head grade of 1.73% U3O8 over the life of mine. It is envisaged that mine production will be fed into a conventional uranium processing plant where uranium recovery is projected to be 96.0% over the life of mine. It is envisaged that cemented paste fill tailings will be used, where tailings are constituted into a paste, mixed with approximately 5% cement and delivered back underground. The cemented paste fill tailings will be used to backfill stopes and the excess will be placed in a, purpose built, Underground Tailings Storage Facility (see Figure 3 below). Among many other benefits, this tailings management process is expected to significantly reduce the surface footprint of the project. The positive results of the PEA are a function of a conventional long-hole stope mine plan conceivably extracting compact near-vertical high-grade uranium mineralization localized in competent crystalline basement rocks. 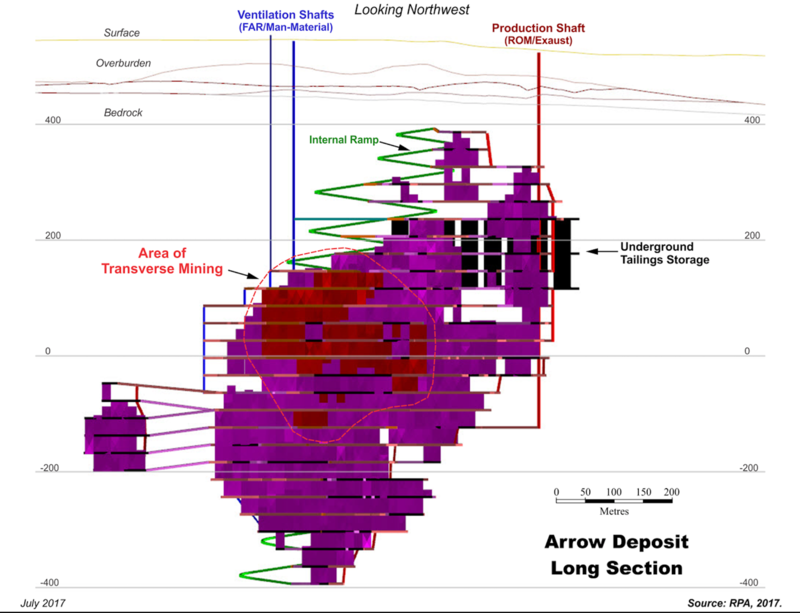 Arrow is considered an optimal deposit for long-hole stope mining because it is comprised of stacked high-grade veins with strong continuity on strike, dip and vertical extent. Additionally, there are natural pillars due to the spacing between the mineralized A1 through A4 shears. Due to the geometry of the Arrow deposit, approximately 93% of the mineral resource was converted into mineable resources. The positive results of the PEA are further supported by a high process recovery rate (96.0%), due to simple mineralogy and low deleterious elements. The capital costs (CAPEX) for the contemplated underground mine, process plant and supporting infrastructure at Arrow are estimated at CAD $1.66 billion including initial capital costs of CAD $1.19 billion. The initial capital cost includes a contingency of 25% or CAD $237 million. RPA estimated the capital costs based on input and consultation with leading expert service providers who have experience in construction projects and cost estimation both in the Athabasca Basin and globally. The CAPEX is summarized below in Table 4. The operating cost estimate (OPEX) is based on a shaft accessed underground mine with a conventional longitudinal and transverse long-hole stope mining method, conventional processing facility and underground placement of cemented paste tailings. 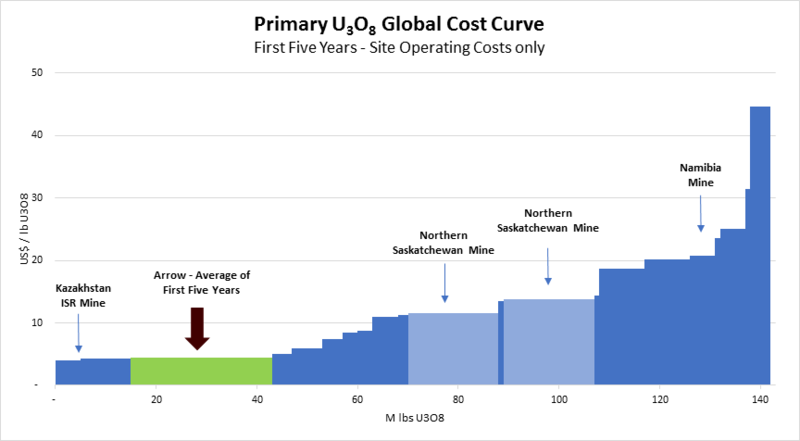 The OPEX is summarized below in Table 5, and the total cash costs and average production from the Arrow deposit over the first five years is compared to current global producers of uranium in Figure 4 and other select underground global producers across commodities in Figure 5. Adapted from SNL Metals and Mining. 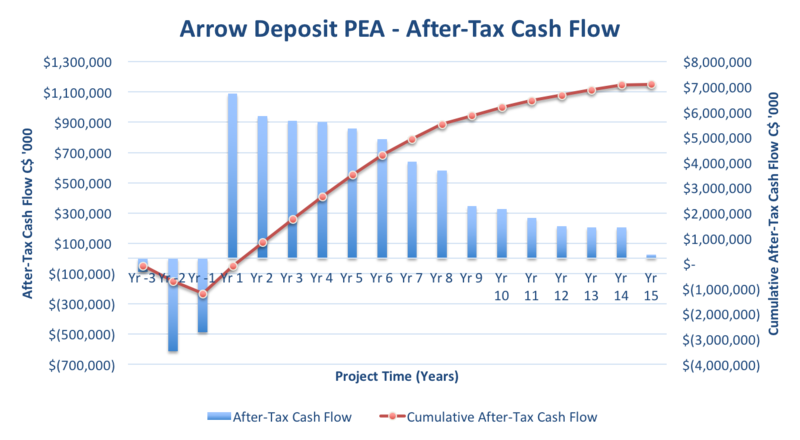 Arrow production and costs based on PEA results. All other data based on 2016 modelled costs and production from SNL Metals and Mining. NexGen makes no representations as to the reliability of this information. SNL estimates costs and production for approximately 70% of uranium operations. Costs exclude sustaining capital costs, taxes, profit-based royalties, depreciation, and corporate costs. The cost curve does not consider secondary supplies of U3O8. Unit operating costs are the sum of site-based mining, processing, and general and administration. All of the comparable projects are underground mines with production rates ranging from nominally 1,000 tpd to 6,000 tpd. The majority of data points are mines that are considered to be in remote areas. Data is based on a variety of sources, including SNL Metals and Mining, and publicly available information. NexGen makes no representations as to the reliability of this information. The PEA is preliminary in nature and includes inferred mineral resources that are too speculative geologically to have economic considerations applied to them that would enable them to be categorized as mineral reserves. There is no certainty that PEA results will be realized. Mineral resources that are not mineral reserves do not have demonstrated economic viability. NexGen will host a conference call and accompanying live webinar today, Monday July 31, 2017 at 8:15 a.m. Eastern Standard Time. NexGen will discuss the results of the PEA before opening the call to questions from participants. To join the call please dial (647) 427- 7450 (Local/International) or (888) 231-8191 (North America Toll Free) and an operator will put the call through. An accompanying live webcast and slides are available at the following link https://event.on24.com/wcc/r/1473876/9E04D006580642EEF7C22DCE3E35143A. A recorded version of the proceedings will be available on our website (www.nexgenenergy.ca) shortly after the call. The playback numbers are (416) 849-0833 (Local/International) or (855) 859-2056 (North America Toll Free) (Playback Passcode 60229327) and available until October 30, 2017. 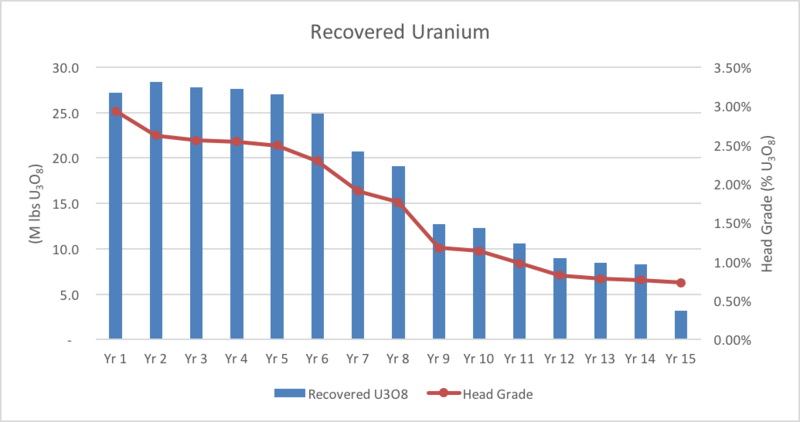 NexGen owns a portfolio of prospective uranium exploration assets in the Athabasca Basin, Saskatchewan, Canada, including a 100% interest in Rook I, location of the Arrow Discovery in February 2014 and Bow Discovery in March 2015 and the Harpoon discovery in August 2016. The Arrow deposit’s updated mineral resource estimate with an effective date of December 20, 2016 was released in March 2017, and comprised 179.5 M lbs U3O8 contained in 1.18 M tonnes grading 6.88% U3O8 in the Indicated Mineral Resource category and an additional 122.1 M lbs U3O8 contained in 4.25 M tonnes grading 1.30% U3O8 in the Inferred Mineral Resource category. The scientific and technical information in this news release with respect to the PEA has been reviewed and approved by David Robson, P.Eng., M.B.A., and Jason Cox, P.Eng. of RPA, each of whom is an independent “qualified person” under National Instrument 43-101 – Standards of Disclosure for Mineral Projects (“NI-43-101“). All other scientific and technical information in this news release has been approved by Mr. Garrett Ainsworth, P.Geo., Vice President – Exploration & Development for NexGen. Mr. Ainsworth is a qualified person for the purposes of NI 43-101 and has verified the sampling, analytical, and test data underlying the information or opinions contained herein by reviewing original data certificates and monitoring all of the data collection protocols. The mineral resource estimate referred to herein was announced by the Company on March 6th, 2017, and has an effective date of December 20, 2016. For details of the Rook I Project including the quality assurance program and quality control measures applied and key assumptions, parameters and methods used to estimate the mineral resource set forth herein please refer to the technical report entitled “Technical Report on the Rook 1 Property, Saskatchewan, Canada” dated effective March 31, 2017 (the “Rook 1 Technical Report“). The Rook I Technical Report is available on NexGen’s issuer profile on SEDAR at www.sedar.com. A new technical report in respect of the PEA, that will supersede the Rook 1 Technical Report, will be filed on SEDAR (www.sedar.com) and EDGAR (www.sec.gov/edgar.shtml) within 45 days of this news release.